The S&P 500 has staged an impressive 16% rally off the December 2018 lows. The index is currently testing a flat 200-day moving average. This is one of the most widely watched technical indicators so naturally, there has been a lot of chatter about it lately. Some fear that it will act as resistance and force us to re-test the December lows, while others argue that its significance is overstated. One technician who thinks the 200-day moving average will halt this rally is David Keller. He is the founder of Sierra Alpha Research and former managing director at Fidelity Investments. He wrote a post on Seeitmarket.com this week, where he answered some common questions about the 200-day moving average and explains why he thinks that it’s going to be a problem for the S&P 500 going forward. He argues that one reason the indicator is so significant is that most charting platforms have the 50 and 200-day moving averages built in by default. 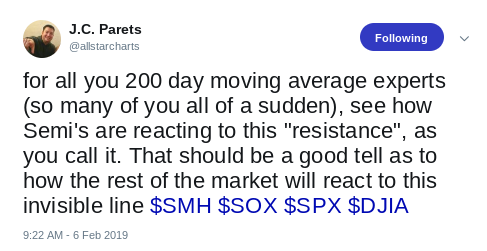 For this reason, he describes it as a sort of self-fulfilling prophecy where the indicator acts as resistance simply because everybody is watching it and expects it to. Other technicians disagree with Keller’s concern over the 200-day moving average. J.C. Parets, founder of All Star Charts is one of them. In the tweet below he argues that industry groups like Semiconductors serve as a better leading indicator than the 200-day moving average. He downplays its significance by calling it an “invisible line” and thinks that Semi’s are signaling that the market can move higher from here. It’s important to note that S&P 500 has been moving sideways at the 200-day moving average for 2-3 days now. Clearly, there is a lot of disagreement over whether or not it will be an issue for the market. It’ll be interesting to see how price responds at the 200-day moving average. We’ll be sure to keep an eye on it and report back with any major developments.